Carbide is similar to cement: Think of the carbide grains as the gravel and the cobalt as the cement that acts as a binder to hold the grains together. Tungsten carbide is a homogenous mixture of tungsten carbide grains in a tough cobalt binder matrix. Essentially, tungsten carbide (WC) is a composite material manufactured by a process called powder metallurgy. Tungsten carbide powder, generally ranging in proportion between 70%-97% of the total weight, is mixed with a binder metal, usually cobalt, compacted in a die and then sintered in a furnace. Cemented Carbide may also contain proportions of Titanium Carbide (TiC), Tantalum Carbide (TaC) or Niobium Carbide (NbC). 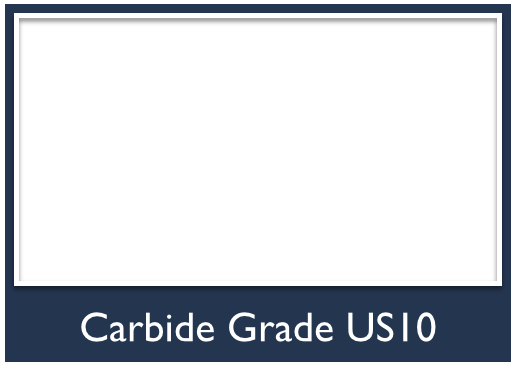 Nano, Ultrafine and Submicron grades of carbide are what are generally used for end mills. They have a binder content in the range of 3-12% by weight. Grain sizes below 1μm have the highest hardness and compressive strengths, combined with exceptionally high wear resistance and high reliability against breakage. 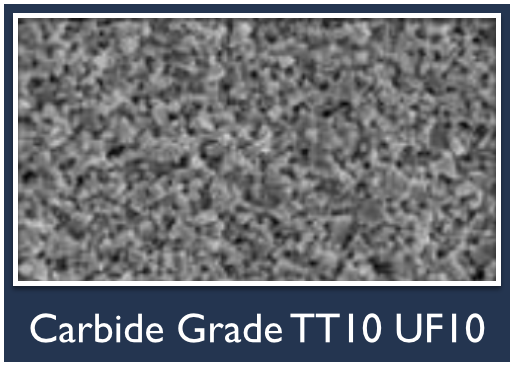 In general, smaller tungsten carbide grain sizes allow for the manufacture of carbides with a finer microstructure. A prerequisite for this is the prevention of grain growth during the sintering process by adding suitable doping (process of adding some impurity atoms) components in the right amount, adjusted to the cobalt content. The cobalt content is determined based on the required performance specifications for the carbide. 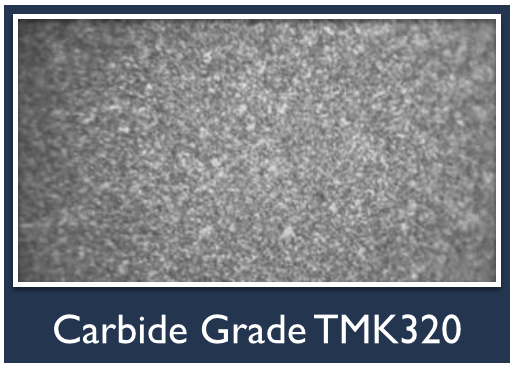 Since the specific surface of a carbide depends reciprocally on its grain size, a finely-grained carbide can adsorb more binder than a coarsely-grained TC. An increase in cobalt content results in increased toughness (TRS) while hardness and wear resistance are reduced. This opposite development of the two desirable parameters, hardness and toughness, can be countered by reducing the carbide grain size. The result is an increased hardness because of the finer grain of the carbide which at the same time permits a high binding metal content as the grain structure offers a large surface area on which to bind: It also creates a high toughness. 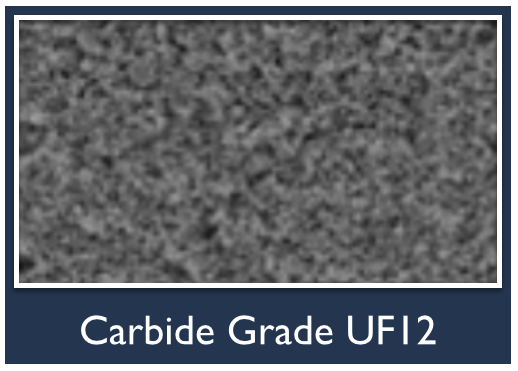 Consequently, superfine grain carbide grades offer increased hardness while maintaining toughness. Sandvik's H10F grade offers an excellent combination of strength and toughness. In addition, a special additive maximize corrosion resistance without loss of toughness. Grades with binder content in the range of 10 wt % and grain size below 1um have the highest hardness and compressive strengths, combined with exceptionally high wear resistance and high reliability against breakage. milling of aerospace materials, e.g. titanium. Submicron grain WC with 10% Co • High toughness and wear resistance. steels, acid and heat resistant steels, chromium alloyed steels, nickel & cobalt, titanium alloys, non ferrous metals, & plastics. steels, acid and heat resistant steels, chromium alloyed steels, nickel & cobalt, titanium alloys, non ferrous metals, plastics. 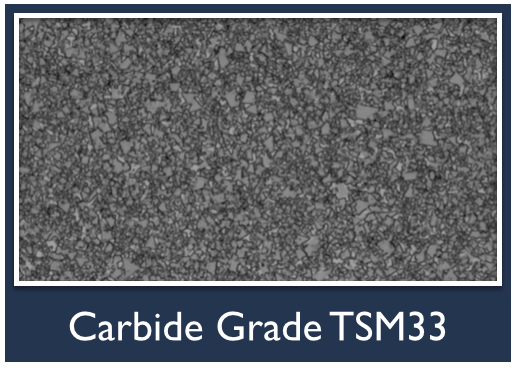 CERATIZIT’s new high performance carbide grade CTS20D successfully enhances and optimizes the tried and tested properties of TSM33. 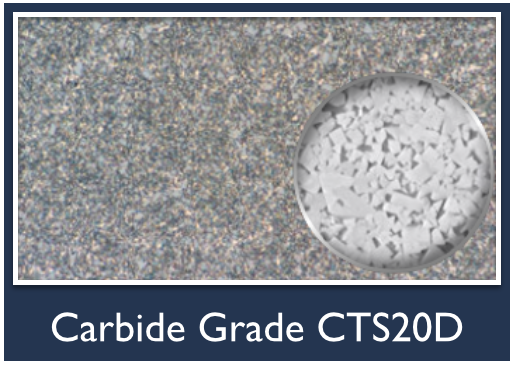 The results of practical tests reveal that carbide rods in CTS20D show a higher transverse rupture strength and increased resistance to chipping. for the machining of stainless or heat-resistant alloys. Micrograin WC grade for general purpose, commonly used for drilling and milling grey cast iron, stainless steel and heat resistant alloys. 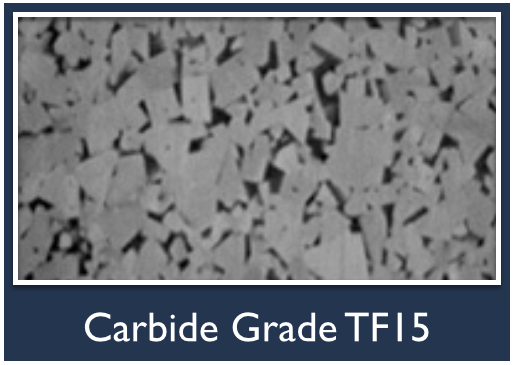 Mitsubishi Materials TF15 grade has exceptional advantages of high strength and toughness with optimizing high breakage resistance sharpness. Sub-Micron Grade Cemented Carbide for Rotary Tools. Ultra Fine Grade Cemented Carbide for Rotary Tools. Cemented Carbides used in end mills contain WC and Co only (i.e. two phases) and a few trace elements. These grades are classified according to their cobalt content and WC grain size. As shown in the diagram, as grain size increases, TRS values increase and wear resistance decreases. Grades with binder content in the range 10-20% by weight and WC-grain sizes between 1 and 5 μm have high strength and toughness, combined with good wear resistance. Grades with binder contents in the range 3-15% and grain sizes below 1 μm have high hardness and compressive strength, combined with exceptionally high wear resistance. First, mix tungsten carbide with cobalt to make powder which can be classified as raw materials. The granulated mixture is poured into a die cavity and pressed. It gives a moderate strength like that of chalk. Next, the pressed compacts are placed in a sintering furnace and heated at a temperature of about 1400°C, resulting in cemented carbide. TRS - Transverse Rupture "Strength"
The strength of cemented carbide is measured by the transverse rapture strength test (TRS), which is a simple three-point bending test. The TRS value indicates the relative strength of the tools. The TRS test is also an indicator of the quality level of the product. As cemented carbide is a relatively brittle material, its strength is strongly affected by inherent flaws and defects. Thus both the mean TRS value and the standard deviation of values of the TRS value ca also be used a guide to quality and performance. The TRS value of a cemented carbide can be increased by increasing the binder content and using a smaller grain size. As a rule of thumb the tensile strength of tungsten carbide is approximately half of the transverse rupture strength. The values for transverse rupture strength of cemented carbide grades that appear in various suppliers’ properties charts are based on the above standard test and thus, reflect the mechanical strength for this sample size only. Many application engineers often regard the TRS values as the design strength value for a grade and use it in designating which grade should work in a particular application, expecting that value to hold true. In reality, these values decrease as the size of the part increases and the design strength value for larger pieces must be calculated due to the size effect. Therefore, Fracture Toughness is a better gage of performance in End Mills. Finding exact solutions to impact problems can be extremely complex. Formulas for impact stresses show that stress varies directly with the Modulus of Elasticity hence, cemented carbide, having a high modulus of elasticity, is not suitable for all impact applications. However, given the hardness of cemented carbide, especially a higher binder grade containing 25% cobalt binder with a coarser grain structure, a surprisingly high degree of impact strength is exhibited. 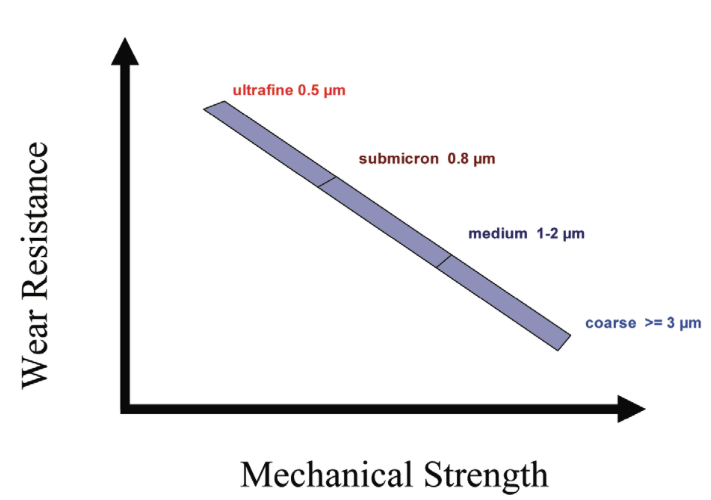 Transverse Rupture Strength (TRS) is often mistakenly used as a measure of impact resistance when, in fact, fracture toughness is a better indicator of the ability of cemented carbide to withstand mechanical shock or impact. 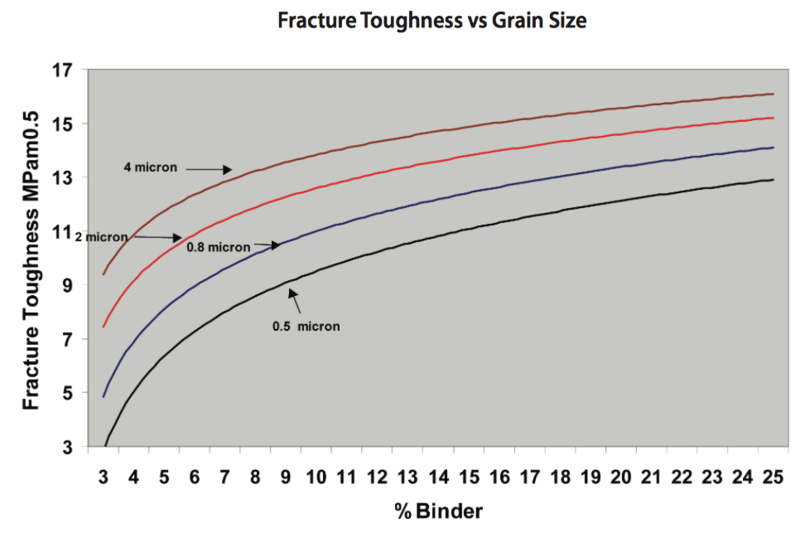 Fracture toughness varies according to grain size and binder content as shown in the diagram. See the Palmqvist Indentation Test below for more information. 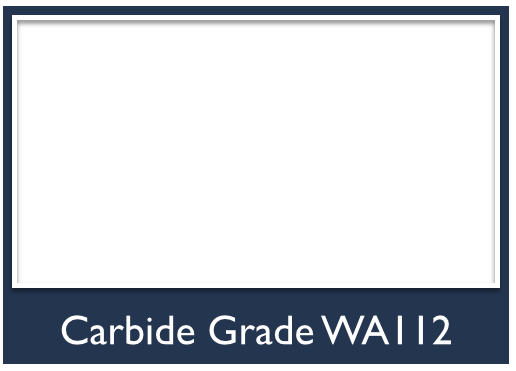 The binder in most grades of Tungsten Carbide is Cobalt. The binder is added as a percentage by weight varying from 3% to 15% in rotary cutting tools. The amount of binder used is a very important factor in determining the properties of each grade. As a rule of thumb the lower the cobalt content the harder the material will become. However variation in grain size and additives can upset this rule. 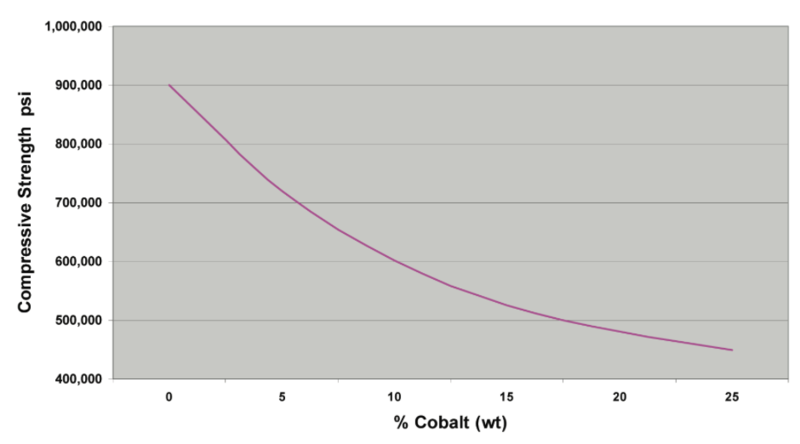 The key item to note is that the percentage of Cobalt is "BY WEIGHT". If you've ever held a cobalt end mill in one hand and carbide end mill in the other hand you can feel the difference in weight. When we say it's a 10% or 12% Cobalt by weight that is actually a much greater amount by volume. A 12% cobalt content by weight could translate to greater than 20% by volume. 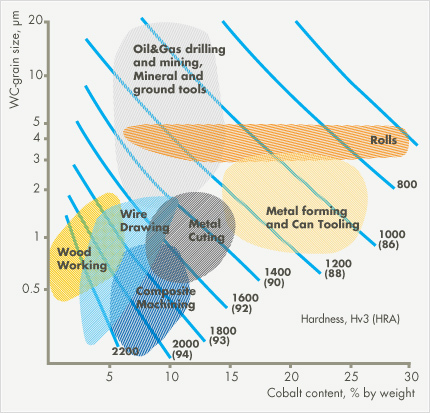 An increase in cobalt content generally increases the transverse rupture strength and the "toughness" which is what you want in miniature end mills, but you will sacrifice some "hardness." Hardness is the relative ability of one material to wear, abrade, deform or indent another material. Hardness values for cemented carbide are usuall expressed in terms of Rockwell “A” or Vickers values. The diamond is the hardest material known to man; all other materials have their hardness expressed in terms of it. The hardness of cemented carbides is generally measured on the Rockwell A scale and shown as HRA. The Rockwell scale is a hardness scale based on indentation hardness of a material. The Rockwell test determines the hardness by measuring the depth of penetration of an indenter under a large load compared to the penetration made by a preload. The hardness value indicates the wear resistance properties of a tool In general, the harder the grade, the higher the wear resistance of the cutting edge and longer the tool life. For cemented carbides, the hardness will increase as the cobalt content is decreased and also as the particle size of the tungsten carbide is decreased. 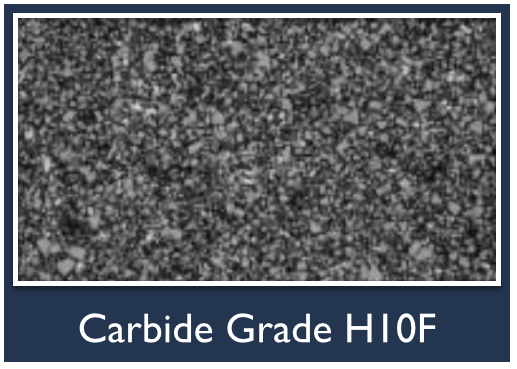 Tungsten Carbide falls between 8.5 and 9.0 on Moh's hardness scale, making it almost as hard as diamond. In order to polish or finish tungsten carbide, a diamond covered tool must be used because any other metal or mineral would not be able to withstand its hardness. Only a diamond is hard enough to be able to scratch Tungsten Carbide. Hardmetals — Metallographical determination of porosity and uncombined carbon: ISO4505 This test involves a visual examination of a polished surface. It is stated as "A" microporosity, "B" macroporosity, or "C" as free carbon in the microstructure. 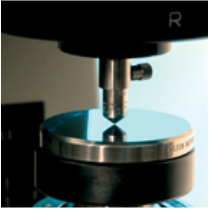 The term "porosity" simply refers to the presence of microscopic pores in the Tungsten carbide/Cobalt matrix. If the total porosity or if the volume of the largest pores present exceed a critical value, then the properties of the material can be affected. Typical porosity is rated in three different types and at different levels according to the estimated total volume of porosity in the sample. This property is also one of the most important attributes of cemented carbide. Ductile materials under compression loading merely bulge or swell without fracture but a brittle material will fail, due mostly to a shear fracture than true compression. Cemented carbide exhibits very high compressive strength when compared to most any other material and the value increases with decreasing binder content and decreasing grain size. 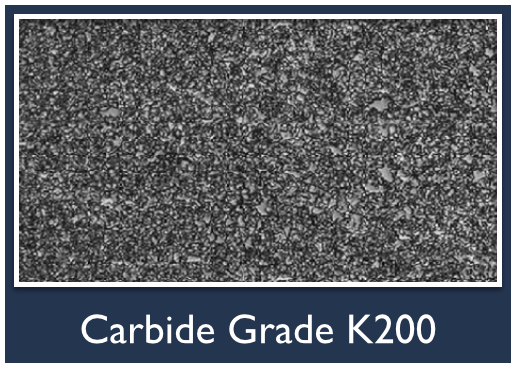 Depending on the grain size and binder content, values between 400K-900K psi (7 kN/mm2) are typical for cemented carbide. 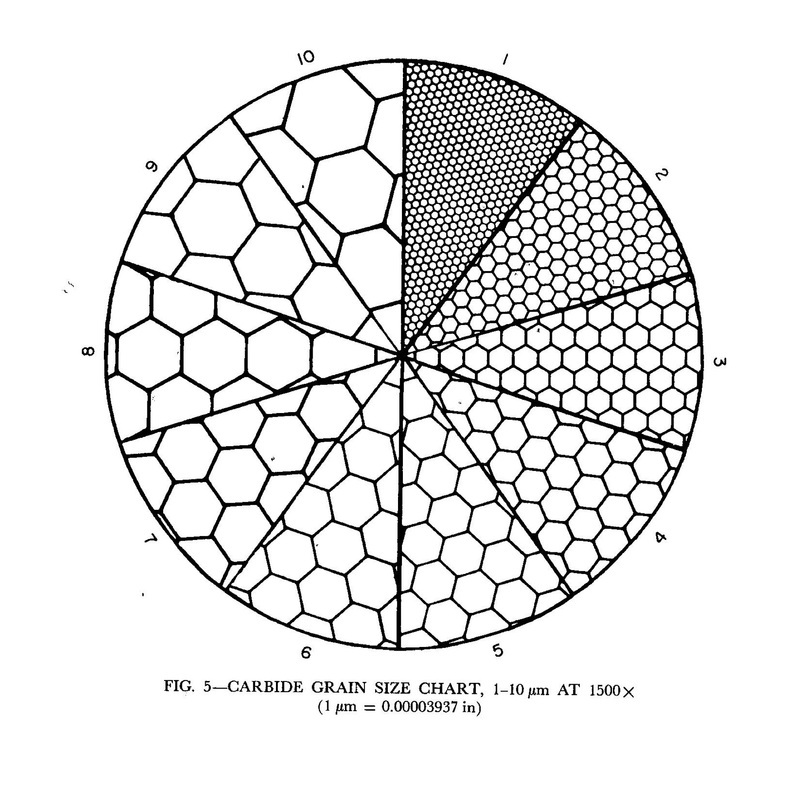 The uniform WC grain size distribution throughout the microstructure is the preferred condition. The presence of individual coarse WC grains in the microstructure can contribute to reduced tool life. Hydrogen sinter, an early form of the sinter process where green carbide is heated in a form of hydrogen gas atmosphere, i.e. pure hydrogen, hydrogen/nitrogen gas mixture or dissociated ammonia. Vacuum sinter, in this process the green carbide is heated in a vacuum furnace either at vacuum or in a partial argon environment. Vacuum Sintering is prone to an effect called "Cobalt Pooling" or "Cobalt Lake" formation where the Cobalt "pools" together in one area. Post- HIP, Hot Isostatic Pressing, is a technology of isotropic compression and compaction of the material by use of high- temperature and high- pressure gas as a pressure and heat transmitting medium. It's generally performed on parts already sintered and can often result in grain growth. Sinter-HIP, vacuum sinter with a post HIP operation, (Hot Isostatic Pressure). In this process the carbide is first vacuum sinter; at the end of the vacuum sinter process the vacuum is replaced by pressurized argon gas of many atmospheres. The vacuum sinter process creates a sealed envelope of molten binder metals around the carbide. Sinter-HIP process eliminate the possibility of Post- HIP "Grain Growth"
Sinter-HIP should not be confused with a process sometimes called "post-HIP" or autoclave. In the Sinter-HIP process, sintering and HIPing are combined into a singe process step. In post-HIP the material is sintered then placed in a separate furnace to be re-heated and have pressure applied. Sinter-HIP takes place at much higher temperatures and lower pressure then post-HIP and is widely considered to produce a superior product. This describes how the size of an object changes with a change in temperature. Specifically, it measures the fractional change in size per degree change in temperature at a constant pressure. The value indicates the amount of expansion which might be expected when heat is applied to the material. 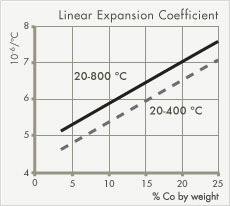 The expansion rate increases with temperature increase. The more Cobalt binder that is present the higher the expansion rate. 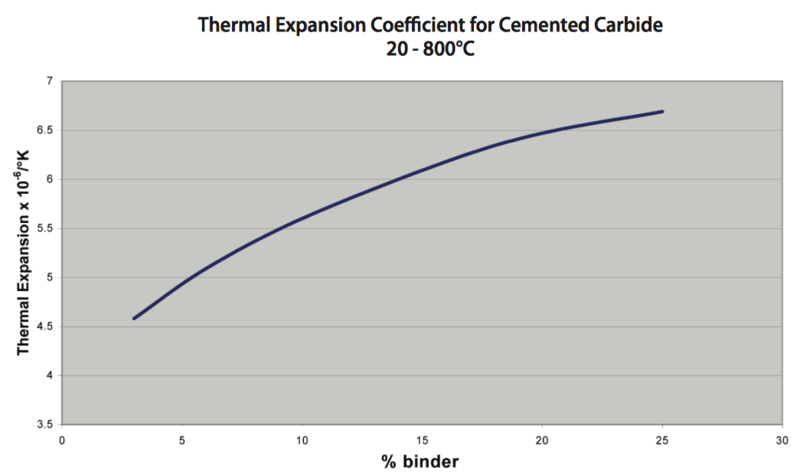 Generally, Cemented carbide has a very low coefficient of thermal expansion. Tungsten Carbide is about 1/3 to 1/2 that of tool steel. Tungsten Carbide conducts heat much more rapidly than tool steel. Thermal conductivity rates go down as the binder content goes up. Pure WC is an excellent conductor of heat but WC-Co cemented carbides have a thermal conductivity factor of about one-third that of copper. 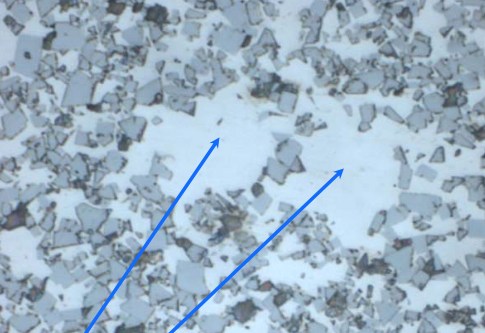 Grain size has no noticeable effect on this property, however, the presence of titanium carbide or tantalum carbide additives will decrease the thermal conductivity factor significantly. Cemented carbide will retain most of its strength at elevated temperatures. It has exceptional high hot hardness, a property readily taken advantage of in metal cutting applications. However, as temperatures approach 1000F, oxidation will occur. This appears as a powder layer or flakes on the surface of the carbide, which are easily abraded away. Above 1000F, oxidation is too severe for cemented carbide to be used. 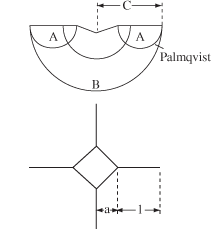 The Palmqvist indentation test evaluates the surface fracture toughness of the material. The Palmqvist indentation nor SENB standard test is directly applicable for evaluating the fracture toughness of graded WC–Co materials because the fracture toughness of graded materials varies with in the material. The Palmqvist fracture toughness can be inferred from the total length of cracks produced at opposite corners of a Vickers indent. The hardness profile measurement can directly reflect the change in the microstructure of tool gradient cemented carbide. 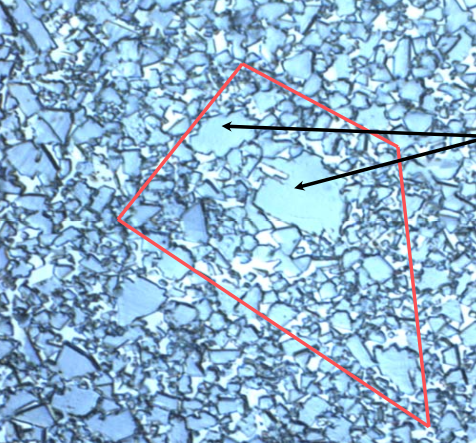 Palmqvist fracture toughness can be inferred from the total length of cracks produced at opposite corners of a Vickers indent and from the hardness of the specimen. The sum of crack lengths values into Palmqvist fracture toughness values is used. 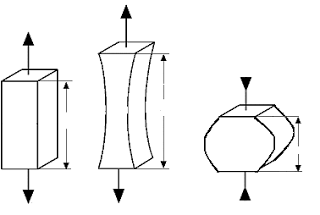 If a section of homogeneous material is subjected to a tensile load and increases in length by a portion, it will exhibit a reduction in dimensions widthways. 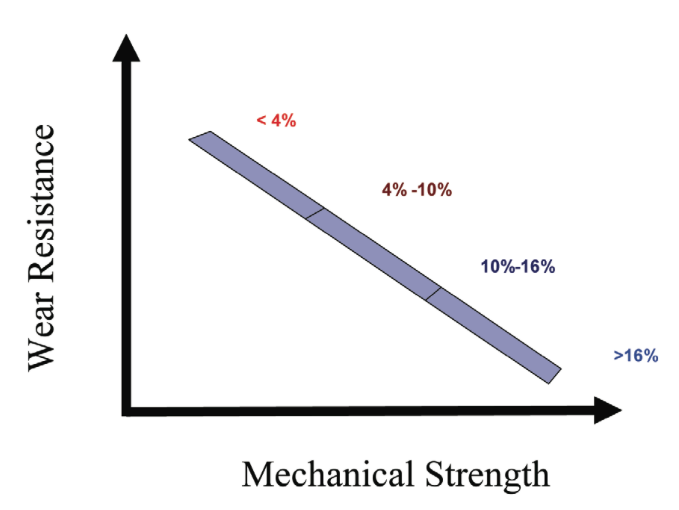 If the bar is maintained within the elastic limits of the material, the ratio of the strains will be a constant. The compressive side of Poisson's ratio may most easily be described by thinking of a marshmallow held between two flat plates. As the plates are pushed together the marshmallow is compressed and squashes out. All metals, even Tungsten Carbide, squash out at least a very small amount. The ratio varies only slightly with the amount of cobalt binder. The Poisson’s ratio of Tungsten Carbide is around 0.24, compared to Titanium which is 0.33. The density, usually expressed as grams per cubic centimeter, is checked on each batch to ensure that the correct amount of cobalt was added. Density is determined according to the ASTM standard B311. Since cemented carbide is a composite material, and its constituent ingredients have varying individual densities, the density of cemented carbide varies with composition. Combining these materials in various proportions creates variation in the density of the cemented carbides in line with their composition. A density of 14.5 g/cc is typical for a 10% cobalt binder material. This value is twice the density of a 1040 carbon steel, which is an important consideration when weight is a factor in design. The density of cemented carbide will increase as the amount of binder is decreased.